However, once we got to the bus which was about to open its door, all signs of piety and spirituality went out of the window and it was a clear case of every man for himself! Pandemonium reigned as the pilgrims wielded their hips and shoulders to get on and swept down like hawks on any available seat. 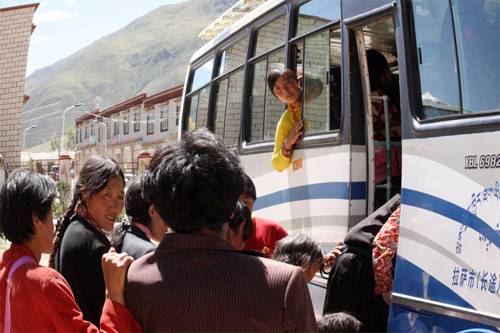 We didn’t stand a chance ….I’ve fought my way on to many a bus on my travels, but I was no match for the old Tibetan ladies and their piercing elbows that they dug in to my ribs, neck and sides as I tried to board. Margie just gave up. So it was to be the plastic stools in the aisle for us, where we crouched precariously among the pilgrims’ feet and bundles. Once the whole bus was packed to the gills, we set off. The conductor squeezed his way around the bus, collecting the 20 Yuan return fee and assigning people with seats a number to remember for the way back. Aisle-sitters didn’t receive anything, we were just told to remember that we belonged to bus no 4. 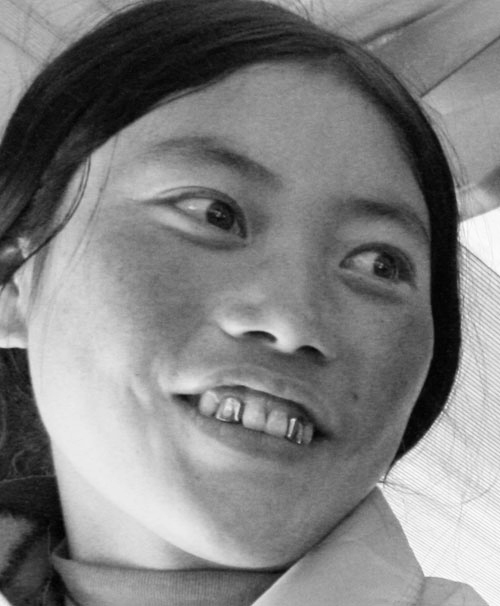 Our fellow passengers, once we got a chance to look around, turned out to be a real motley crew: right behind us there were three grubby teenage girls dressed in pink, with the chapped red cheeks that are so common around here, munching on pips and unashamedly spitting out the husks, showing off their golden teeth. 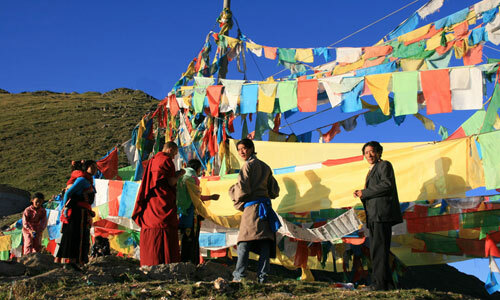 There was an educated monk, travelling with his elderly mother, a whole bunch of venerable grannies and old men, young families with children; there were people in traditional dress with many heavy adornments, as well as smart young men in suits, carrying video recorders and mobile phones. The pip spitting young girls were particularly curious about us; they commented on and pointed at everything, from our clothes to Margie’s blond hair to the way we blew our noses. Anything thing we took out of our pockets instantly became the epicenter of an animated discussion. 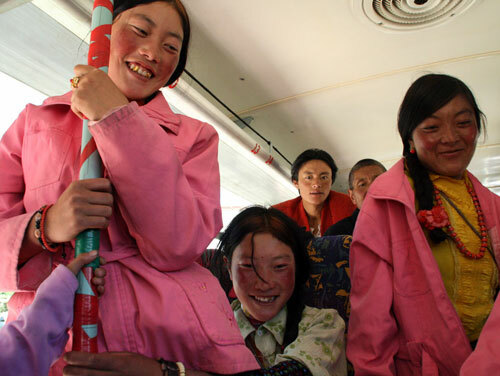 Normally, an early morning bus is a solemn affair, the passengers usually being more or less comatose, but the No.4 pilgrim bus to Ganden was just the antithesis, with joyful screams and shrieks of laughter and children scrambling over the backs of the chairs. We gave up any idea of dozing and just joined in the fun. It at least made the journey quick and we were able to forget; well almost, the discomfort of the tiny plastic stools. 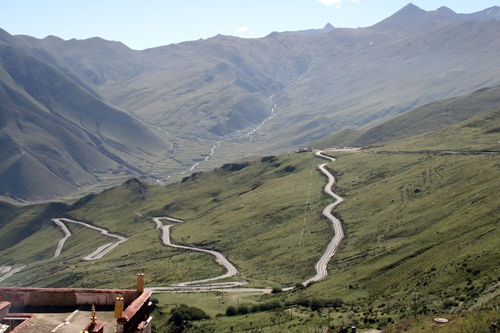 The 1 hour and 20 minute ride, as far as we could make out, went first along the flat and fairly straight Lhasa-Sichuan Highway. However, for the last 6 kilometers the bus had to turn off the main highway and onto an incredibly tortuous road, full of U-turns, which eventually leads to the monastery, set in a truly dramatic location, high up on the Gokpori Ridge. We followed our fellow passengers up to a crest and the start of the Ganden Kora (a walking circumambulation around a temple) from where we came upon a real sea of prayer flags flapping in the wind. The newly arrived pilgrims quickly began adding even more, all of them carefully arranged in their color order, blue, white, red, green, yellow (from left to right or from top to bottom). 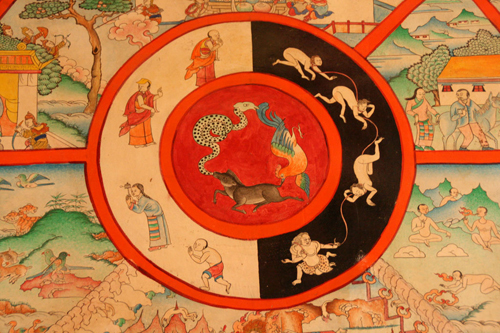 These colors represent the elements: space, air, fire, water and earth. 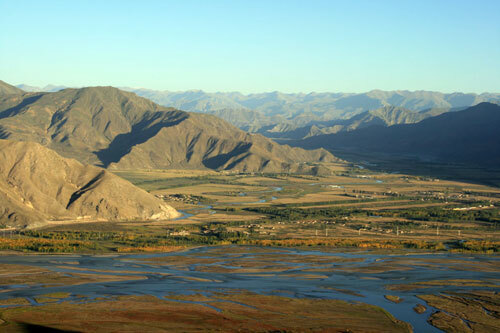 The Kora leads from the prayer flags down behind the monastery; we stood for a moment, overlooking a floodplain, full of meandering streams in different shades of blue. From time to time we came across little burners to burn juniper, or simple shrines, where pilgrims leave gifts of baked-mud statues, stones or incense. 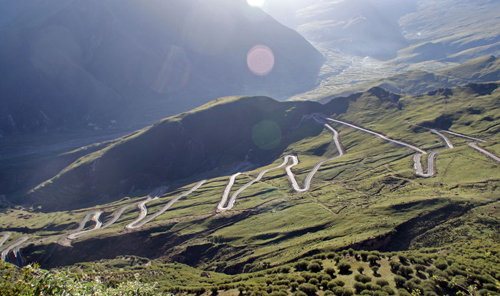 It took us about an hour to complete the circuit, stopping from time to time to catch our breath, due to the altitude. Then we started our exploration of the monastery itself. 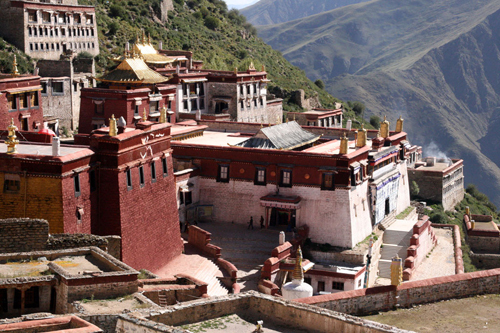 According to tradition, Ganden monastery was built by Tsongkhapa himself, the founder of the Yellow Hat or Gelukpa Sect, around 1410, on a site associated with King Songtsen Gampo, the first emperor of a united Tibet and his queens, the Nepalese princess Bhrikuti Devi and the Chinese princess Wencheng. 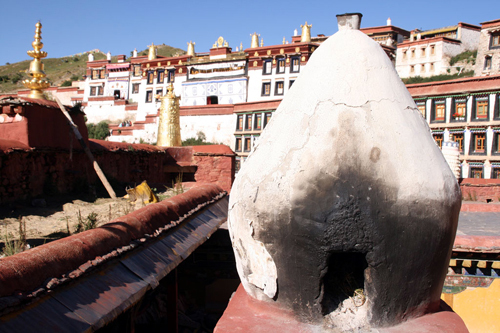 Following the Chinese invasion in 1959, and especially during the Cultural Revolution, the monastery was almost completely destroyed, though restoration and rebuilding work have been going on since the 1980s. The complex is so huge that it is impossible to take it all in, or keep track of what you are actually looking at. So we decided to simply follow the pilgrims and enjoy the views from the many, golden-ornamented roofs. 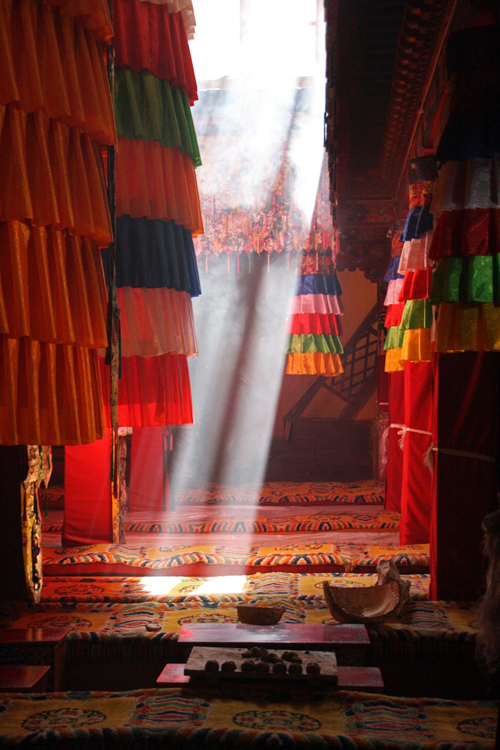 In the imposing main hall, the Serdung Lhakhang, we were particularly taken by some large, beautifully sewn thankas, caught in a sunbeam. We also visited the former living quarters of Tsongkhapa, and a hall which contained a whole library of wooden printing blocks. It was quite touching to see how the – probably illiterate – pilgrims worshipped the ‘books’, touching their foreheads to them and leaving small offerings on top. However, the thought crossed my mind that it would be better if they actually learnt how to read.. In spite of the destruction wrought on it, to which many ruins still testify, and despite the fact that much of what we were looking at had been heavily restored, or simply rebuilt, Ganden is a very atmospheric place and we liked it a lot. In some ways, observing the restoration process is one of its most interesting aspects. For example, we were allowed into a hall with a couple of brand-new mud statues in different stages of completion: one of them was in the process of receiving its first coat of paint, while the other was still drying in front of a small fire. The other highlight of the place is, undoubtedly, the pilgrims. Many of them come from the depths of the country and are extremely traditional and rustic. Both men and women are all bundled up in heavy, long coats, their hair hanging down their back in a myriad of thin plaits, chunky coral and turquoise ornaments adorning their necks, ears, and hair and waist. 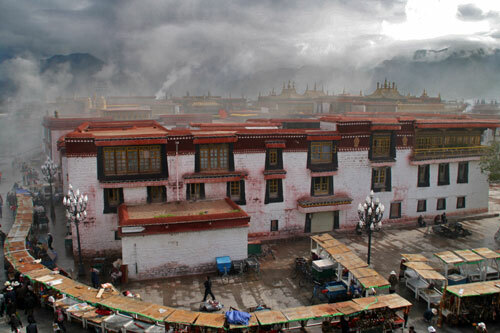 To our great surprise, we found hardly any foreign tourists in Ganden, at least not in the morning. They started arriving just as our pilgrim bus was leaving. The return from Ganden was different. On returning to the bus we just accepted our fate and waited for everyone to board before being given our plastic stools. 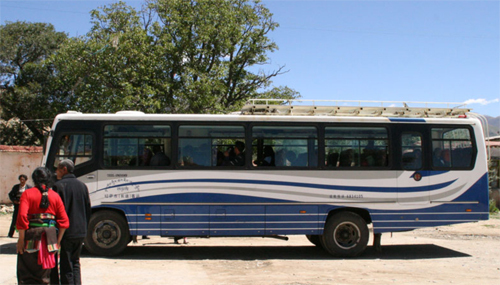 However, once back on the bus, we found that we had been accepted as two of the pilgrims. Our fellow passengers started taking our picture, or posing with us, admiring our watches and testing our walking sticks; all in good spirits. 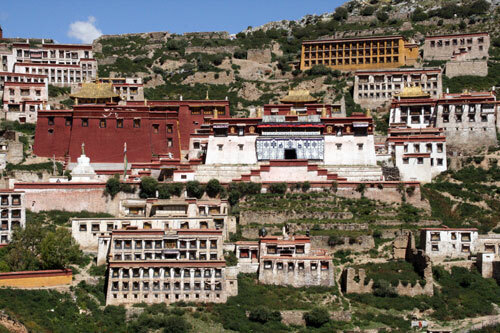 We struck up a conversation with a radical Chinese-speaking monk from a famous monastery in Qinghai who wanted to go and join the Dalai Lama in his exile in Dharamshala (India). He was also radically opposed to the then recently open Lhasa to Beijing train, as it was bringing more and more Chinese settlers. 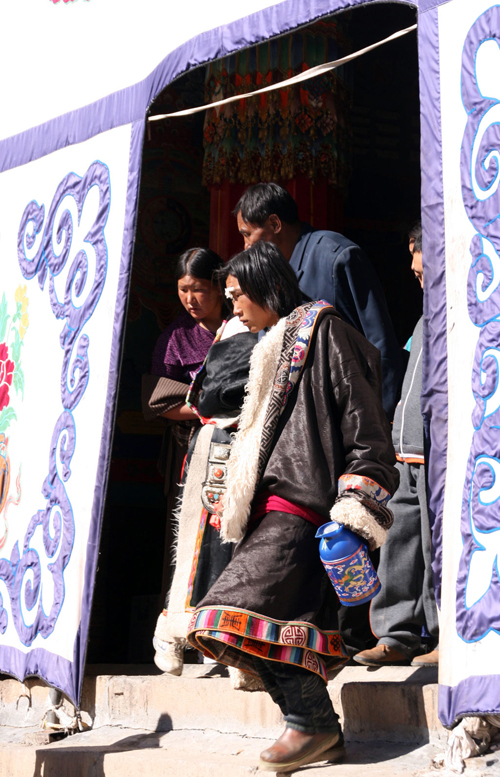 He felt that Tibetans would become second class citizens in their own land, and even worse, a minority. When we nearly had a head on collision with a Chinese tour bus on the way down from the monastery, the pilgrims immediately let out their frustrations by shouting and waving fists at the Chinese driver. 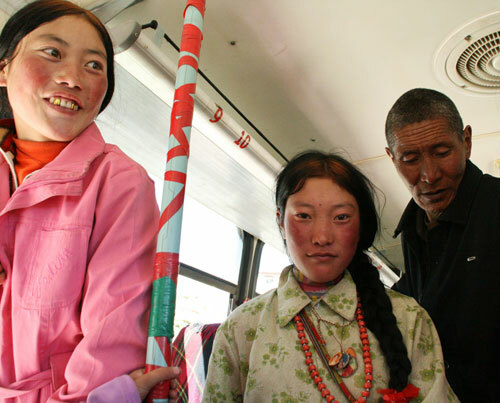 Tensions are never far from the surface in Tibet and that’s probably why the authorities in Beijing don’t want foreigners travelling on local transport in Tibet. The monk from Qinhai also acted as a translator between us and the pilgrims. 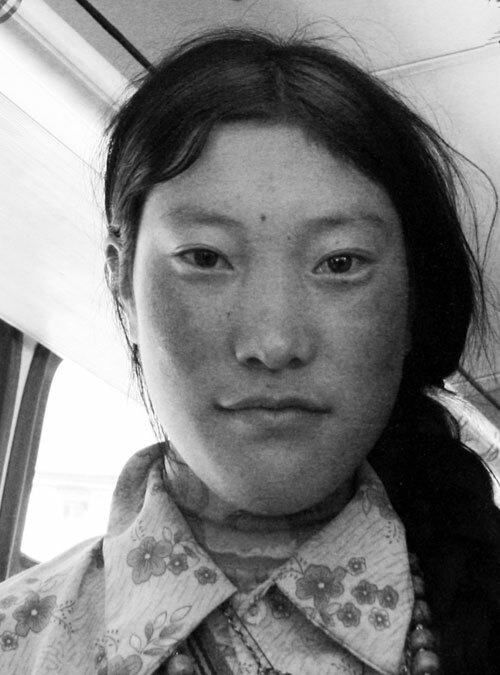 The same pip spitting girls told us that they were nomads from the remote Aksu region and we were the first westerners they had ever met. 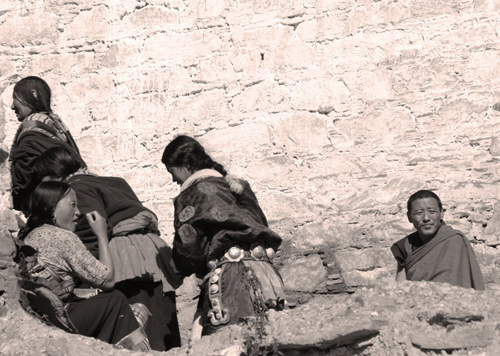 They had never been to Lhasa before and were finding everything truly exciting. Just to prove that people in the world are similar in many respects, these girls, just like any other young people on their first excursion away from home, had also picked up some admirers on the way, and were being openly courted by some very rustic looking lads. We were soon forgotten. We got an extra surprise on the way back with an unexpected stop at another monastery complex whose name we never found out. The monastery must have been important for the pilgrims as they spent more than an hour circumambulating it and placing a lot of money on various statues. We remember the spectacular views towards the snowcapped mountains. 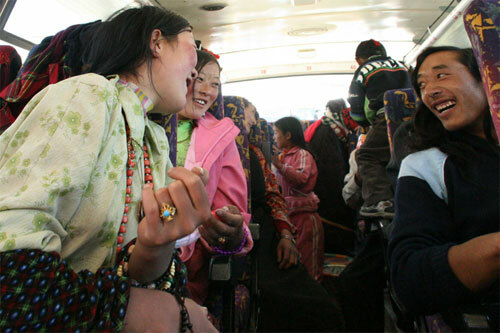 By the time we got back to Lhasa, we had all become the best of friends and gave each other a hearty wave on parting. Getting there and away: Pilgrim buses leave from the west side of Barkhor Square, early in the morning between 6 and 6.30, and take about an hour and 20 minutes to reach the monastery. They start heading back at about 13.00. Return tickets are only 20 Yuan, though you are by no means guaranteed a seat. 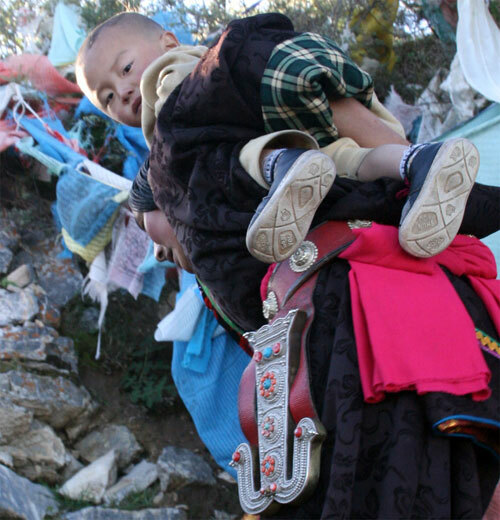 The Ganden – Samye Trek: It is also possible to hike between Ganden and Samye; it is a demanding four- day trek, crossing high mountain passes, on which you have to be completely self-reliant. The trekkers we met had all hired guides, as well as yaks or horses to carry tents and supplies. 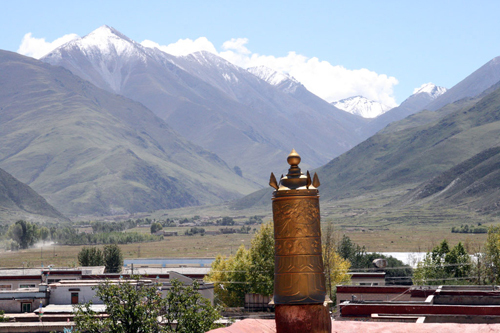 Accommodation and Food: Ganden has a basic guesthouse, a monastery restaurant, as well as a couple of food stalls, serving fried potatoes and boiled eggs during the day.